That’s right Babyologists, Tegu blocks have hit our Australian shores and have never been more beautiful – or fun! I’m constantly amazed by the morphing transformation of the wooden block. Designer after designer keep wowing me with absolutely stunning blocks and Tegu take it that one step further with sets that are not only gorgeous to look at but clever too in that they stick together by way of an internal magnet. Youngsters will love the Tegu Riley Roadster – just five simple pieces click together for hours of zoom-zooming enjoyment. As much as I love a wooden automobile, it’s the Tegu Pocket Pouch that has my heart. A grey felt pouch encases a jungle coloured (green tint, natural and mahogany) combo of eight blocks, perfect for keeping in your handbag for some on-the-go fun. An Endeavour set ($85) of twenty-two blocks is a great starting point for your collection and are available in natural or jungle colours. For those who really want to get stuck into some serious play, the forty-piece Explorer set (priced from $145) is available in jungle or mahogany. If you need more convincing about just how fabulous Tegu blocks are, I definitely recommend viewing the video below! 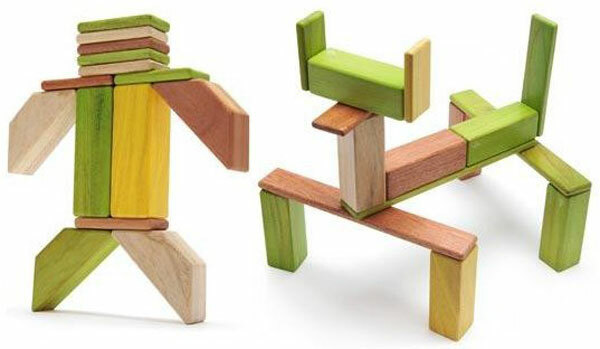 Tegu blocks are available from Educational Experience, which delivers to block builders all over Australia.